Our vinyl flex outdoor material is perfect for your Roll-Ups. The material used is durable and sturdy, ensuring that you can make use of your printed roll-up article for a long period while leaving a high-resolution visual impression for your business. As standard, your roll-up comes without a base, with standard and more premium bases available as an extra. Why You Should Print Roll-Ups for Your Business? Roll-ups must be the most easy to use and easy to install display advertising medium that exists. You take it out of its bag, drop the stand on the floor, and roll up the banner that is in the mechanism. It literally takes 2 seconds. Roll-ups are very similar to X-Stands, with the difference that they are even easier to install, and that their overall design looks more clean and sleek. Their convenience must be the main reason why most businesses decide to print roll-ups rather than X-Stands. 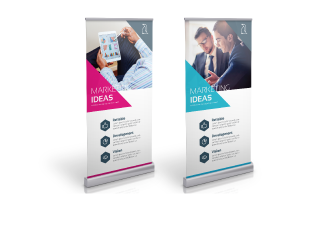 The high quality, transport and set-up convenience, and clean design associated with roll-up banners make them the perfect companions for business conferences, trade fairs, and any other kind of business event. Thanks to a variety of available formats and options, you can print roll-ups for your business that will catch any passer-by’s attention, and draw them towards your company and offering. The roll-up stands offered by Gogoprint rely on qualitative and durable mechanisms that will serve you and your business well for extended periods of time. In addition, the mechanism also allows for simple interchange of banners, in case you need to attend multiple conferences and fairs that target slightly different audiences. 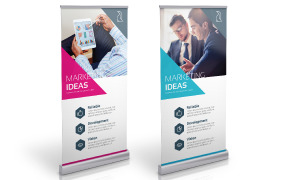 As a result, you can print multiple roll-up banners with targeted designs and marketing messages to reach different audiences, and just use them with one or two roll-up stands. Given their large formats and high visibility, businesses need to design and print roll-up banners with the objectives and best practices of poster design in mind. Indeed, both need to be able to capture the attention of passers-by and lead them to the execution of a call to action that you decided upon. For a detailed overview of best practices, feel free to read through this blog post on the subject. When printing roll-ups with Gogoprint, you can choose between three different kind of stands that come as an extra with the printed banner: standard, double, and premium. The standard base is the one most commonly seen with roll-ups, because it is the cheapest and the simplest. Double bases allow for the display of two banners at the same time, facing opposite sides. That way you can attract customers that pass by on either side of your roll-up. Finally, premium stands offer a sleeker, more modern, and more solid design that will make your roll-up stand out just that little bit more. Hopefully, you understand the marketing and sales potential of a properly designed and printed roll-up banner. When your design is ready, open up the Gogoprint website, configure and order your roll-ups, upload the design, then sit back and relax until your printed roll-ups arrive at home or at your office. Delivery is free nationwide, and Gogoprint guarantees high quality products at a low price. Time to print some roll-ups!